I’ve just finished reading Margaret Atwood’s first published novel, ‘The Edible Woman’ which came out in 1969 and propelled Atwood into the literary world. I’d only read ‘The Handmaid’s Tale’ by her, which I felt (possibly, somewhat controversially) was overhyped and I was keen to see whether I felt this was the case with other Atwood novels. At many points in this novel, I did. I found the prose slow-going and dull in parts and was unable to empathise with the protagonist, Marian, or even care what would actually happen to her. In the introduction, Atwood states that she wrote this novel at 23 and it was published at 24, which probably accounts for the prose laden with imagery and symbolism that is at times shoved down the reader’s throat. A brief summary of the story is that Marian, a young, employed, educated woman, finds herself unable to eat at first meat, then all sorts of other things from the moment she gets engaged, which represents a sort of subconscious rebellion to the patriarchal role of woman in society. I thought the themes that Atwood explored in the novel were incredibly interesting – namely, the conflicting role of women, especially during the late 60’s. Women then were becoming more and more educated but many of the careers they could go into offered few prospects for real progression. At the same time, the idea of female in society was still very much that they should marry and fulfil their womanly duties as wife and mother – an idea which was becoming increasingly at odds with the rise in educated young women. I really liked the representation of women as ‘edible’ , i.e. there to be consumed and devoured by men and I thought the idea was witty and insightful. It was just that I felt the novel dragged on for too long and some of the characters felt a little two-dimensional and in my opinion, didn’t really add much to the story. Atwood uses foils to great extent for the characters to demonstrate their opposing qualities: Marian is contrasted with her roommate Ainsley, who initially seems freer from restraints however interestingly ends up being the character with the more traditional setup (she ends up with a child and a husband). The two predominant male characters seem to be diametrically opposed as well: there is Marian’s inconsiderate fiancée, Peter and the manipulative self-absorbed English graduate Duncan. 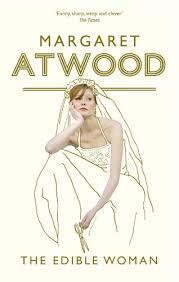 Stylistically, I liked the use of first person and third person to denote the emotions (or in the latter case, the lack of) and it is clear that Atwood is a talented writer; however, I was simply unable to fully immerse myself in her world which felt to me, rather flat and one-dimensional. Having read such great things about Atwood’s writing ability, though, I’ll read a few more of her novels to see if she’s a ‘grower’ but at this moment in time, I’m not a huge fan. Many of the themes I am attempting to explore in my own novel are prevalent in Atwood’s writing so it’s all useful research! ← Film review: Before Midnight – spoiler!